They roll through at night, passing highly populated areas of the county, like downtown San Diego: rail tanker cars sometimes carrying potentially hazardous materials. “There is no question that places like Petco Park are directly in harm’s way,” Eric de Place, Policy Director with the Sightline Institute, an environmental policy organization based in Seattle, said. 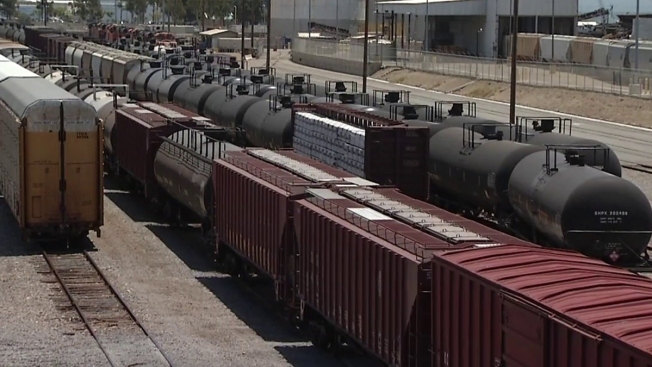 NBC 7 Investigates asked the owners of the local rail lines, North County Transit and Metropolitan Transit System, what chemicals and other materials are moving through the region. North County Transit owns the rails from Orange County to the Del Mar area and Metropolitan Transit System, owns the rails from Del Mar to San Diego. The agencies declined to provide the information, citing homeland security issues. The largest carrier in the region, Burlington Northern Santa Fe railway company, or BNSF, also declined to provide the information. With no public information on exact routes detailing when freight trains are on local tracks and what they are carrying when passing through, railroads say the risk is minimal, but, critics say it's a dangerous situation for San Diegans. San Diego Fire Marshall Doug Perry is involved in first responders planning through the region. According to Perry, his agency is prepared to handle any emergencies arising out of a derailment of hazardous materials. He said his department is told when large amounts or unusual products are moving on the rails, but admits, he isn't aware of everything. In 1996, a train carrying LPG and propane derailed and caught fire in Wisconsin. The fire burned for more than two weeks and caused thousands of residents to be evacuated. A National Transportation and Safety Board (NTSB) sketch of the accident scene shows how the tankers were scattered across the derailment area. According to a website that tracks railcar shipping statistics, Railwayage.com, BNSF carries cement, corn syrup, cars, lumber, aluminum, grain and plastic. NBC 7 Investigates found the Texas-based company also ships propane and LPG. Those materials are just part of a list of the 25 most hazardous commodities transported by rail in California. "If you look at the history we haven't had any problems,” Perry said. “Is there always a potential? Yes." California Senate Bill 84, also known as the "Railroad Accident Preparedness and Immediate Response Program,” includes a provision that would charge freight carriers a fee when hauling any of the 25 hazardous commodities. Kim Zagaris, Safety and Fire Chief for the California Office of Emergency Services said, "the bill is designed to actually provide funding to prepare, plan and respond to hazmat rail incidents." In the Wisconsin incident, an NTSB investigation found an "undetected bolt hole crack" was missed by rail workers during inspection process. NBC 7 Investigates found LPG being transported on track in downtown San Diego several months ago. Materials inside a rail tanker can be identified by a placard on the outside of the container. Rail cars with placards containing the number “1075” were found passing PETCO stadium and at the border crossing area in San Ysidro. The number “1075” represents different forms of liquefied gas. Click here to see a complete listing of what the numbers on placards stand for. The placards are one way first responders can identify what the tanker is carrying. Different chemicals require different responses by hazmat personnel and the fire department. The CPUC is the state agency which oversees the rail industry in California. ​​Zagaris put it this way: "the railroad reminds us they built this country and they have a lot of protection under federal law." He said he believes transparent discussions between the industry and state agencies will go a long way to "protect life, property and the environment" in California. Less than a year ago, Sarah Feinberg was named as FRA’s Administrator. Some say, under her leadership, the agency has improved the agency’s responsiveness to safety and other rail issues. Besides the fee for hauling hazardous commodities, ​California Senate Bill 84 increased the amount of firefighting equipment and specialized training to respond to rail accidents involving hazardous materials. It also provides for a higher level of coordination among public agency first responders when dealing with hazardous material accidents.